A waterfall chart in Excel is a great way to visualize running totals making it super easy to understand how addition and subtraction of values affected starting value and how we reached the final figure. 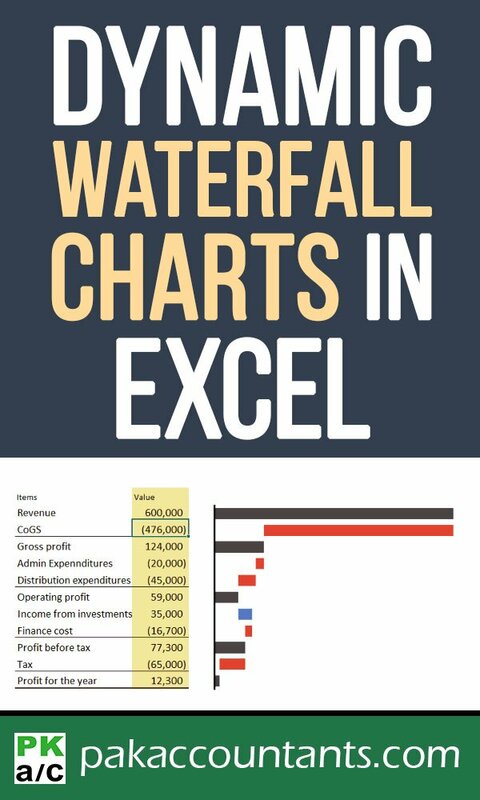 Creating waterfall chart in Excel is not a complex feat anymore with this tutorial! Income statement or Profit or Loss Statements are accountants’ everyday job. Whether you are assessing past performance, current or even forecasting, great chances are that you have make this financial statement. And this is what we are learning today Excel lovers! Not sure if it is called horizontal waterfall chart or vertical waterfall chart. I think it is horizontal as it has elements plotted against x-axis. But anyways whatever the category is I want this to go with the income statement numbers on the left or right and this chart accompanying those numbers to make it much more visually appealing and understandable. And it can definitely go in Excel dashboards! We will see that soon! 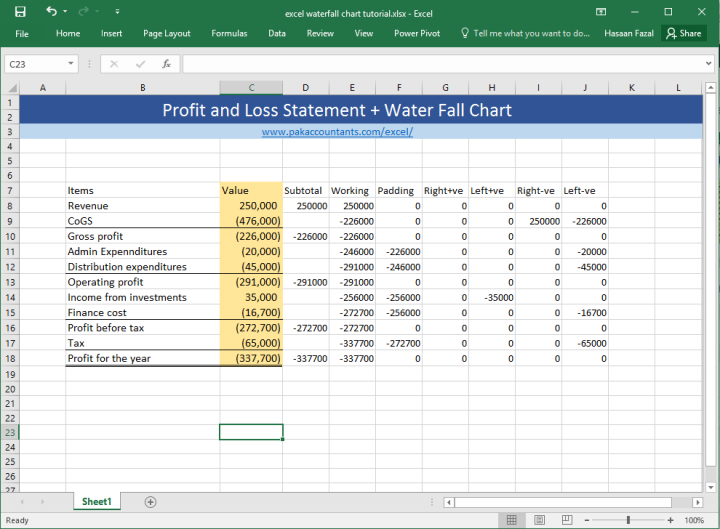 Step 1: Download this Excel workbook it will help you with basic income statement data that we need to make waterfall chart. Once the file is open we need to prepare the data that will feed the chart. This will take some time and patience to do it correctly. But it isn’t this complicated that you throw in the towel just yet. Trust me! Step 3: In subtotals column you will have to work manually to mention which of the figures from the report are not income/expense items rather subtotals. So simply mention the cell reference after equal sign to link the cell to appropriate subtotal including the revenue. This formula is simply checking if D8 is empty then make a cumulative total as we go down the column from cell E8. Once copied in the appropriate cell press enter and drag the fill handle to fill the range. Right so we have the real meat of the problem all chopped and minced and now its ready to grill! Step 10: Select the Items column and then Press and Hold CTRL key on the keyboard and select the subtotal column, padding column, and the last four columns Right+ve, Left+ve, Right-ve, Left-ve. Then click Insert tab > chart group > bar charts > click stacked bar charts and you will have the following ugliness vomited over the worksheet. Don’t worry we will fix it! Step 12: Left click on padding series (you will be able to guess it via legend at the bottom). Go to format > click shape fill > select no fill. See the waterfall chart coming together? We just need to make few change in Excel to complete it. Step 14: Got rid of legends and x-axis labels by simply select and deleting them. Step 16: Just to make the Y axis more visible I simply clicked on it and under Fill and Line options I increased the width and changed the color to solid black. Having this axis in waterfall chart is essential to let excel users understand if the running balance has shifted to negative/loss or staying in positive/profit side. Step 18: Lastly simply select anywhere empty in the chart and under Fill and under border options select no fill and no line. To hide the data underneath simply select the data and hit CTRL+1 and under custom format enter “;;;” and click OK. Adjust the width and height of chart and you are all set to impress! In the end I gave it a personal touch and turned grid view off to make it look cleaner. 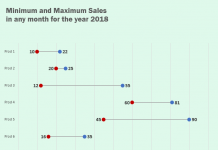 The best thing about this dynamic waterfall chart is that it maintains itself within the specified range and spreads the points on chart by shifting the vertical axis left and right. Hence dynamic vertical waterfall chart is born! Told you creating waterfall chart in excel isn’t that difficult! 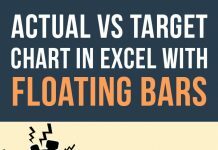 Loved creating waterfall chart in Excel? Pin it! Awesome, really enjoyed making it. Sorry if I missed it, but I don’t see where you indicated what formula to put into the Padding column F.
It is mentioned in step 9. Awesome presentation. only one issue for me, the bars remain black even if its a loss. Thats what i see in the animation as well. is there any way to fix it ?